It was originally part of Queen Mary’s collection in the 1920s. She took apart below wedding gift necklace in a Greek key pattern most likely made by William Davis of E. Wolff & Co. to re-patriate the diamonds and pearls for a new tiara, a Garrads commission. Made of diamonds and pearls in the “Egyptian style,” the tiara also known as the Papyrus Leaf–must be that Egypt theme–is arranged as a band of stylized lotus flowers fanning open underneath overreaching arches. The alternating graduated pinnacles are each surmounted by a single pearl. “It’s very much in the 20s style and probably very lightweight and comfortable to wear,” observes Leslie Field in The Queen’s Jewels. Queen Mary then passed it on to Elizabeth Bowes Lyon upon ascension to Princess of Wales when she wed Bertie. Queen Elizabeth gave it to her younger daughter Princess Margaret in 1959. Princess Peg is probably the one who got the most mileage out of it. 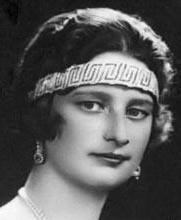 In the 1920s it was still the tradition to wear the tiara low on the forehead, like a horizontal headband. The Queen Mum wore the Strathmore tiara the same way. Think of how Princess Astrid wore the Nine Provinces Tiara and even Queen Hortense wearing the Cameo Tiara. Foreheads. Princess Margaret changed all that when she began wearing tiaras further back from her brow. Besides Windsor mothers and daughters, only three other women have worn the Lotus Flower tiara. Lady Mary Elphinstone, Serena Stanhope and Kate Middleton. The Lotus Flower was loaned to Lady Mary Elphinstone by her sister, almost-Queen Elizabeth to wear for the coronation of “Bertie” aka King George VI in 1937. For the annual Buckingham Dinner in 2013, Kate Middleton chose to wear the Lotus Flower tiara the same way Princess Margaret did. Sure it was a big deal that this was only Kate’s second tiara appearance, the first being the Cartier Halo Scroll at her wedding. But it was an even bigger deal that the Lotus Flower tiara hadn’t been seen since 1993. Twenty years earlier, when Serena Stanhope married Viscount Linley, the Earl and Countess of Snowdon’s son, Princess Margaret loaned the Lotus Flower tiara to her future daughter-in-law to help her anchor that veil. When Princess Margaret passed away, many feared that the Lotus Flower had been sold by her children like the Poltimore Tiara. Unlike the Poltimore, this tiara has too much family history and it was returned to the family collection. That fleeting glimpse of Kate from the Rolls Royce proves it. The Lotus Flower tiara is currently in Paris featured in a large Cartier Exhibition. Isn’t that strange considering it was made by Garrads? This entry was posted in diamond, england, other glittery events, pearl, tiara time! and tagged diamond, duchess of cambridge, Kate Middleton, tiara. Bookmark the permalink. Mary of Teck bequeathed more than just a tiara–her facial features are evident in all the Windsors, as Viscount Linley demonstrates. Good eye! I had to go back and take a look. Why is it that chins are the facial feature I notice the least? Thanks for commenting, Mimi! As you may be able to guess, I’m quite the fan of jewels and times past as well! It’s not really that square peg in a round hole everyone makes you think it is! I think our queen wore it best. Hmm – good point! I meant Queen Elizabeth. Elizabeth II? I don’t think she ever wore it. Princess Margaret’s children gave it back to her in 2002 after their mom died. Duh, stupid me. It is Princess Margaret looking lots like her sister. The photo where she is looking down is my favourite. it reminds me of a necklace sold at auction that was supposedly owned by M@!